16 Single-ended or 3-Wire differential 20-Bit analog output channels. Simultaneous Clocking; Individual R-2R 20-Bit DAC per output channel. Output ranges: +⁄-10V, +⁄-5V, +⁄-2.5V, software-selectable. 8th-Order reconstruction filter at each output. Internal sample rate generator with 24-Bit rate divider. Hardware trigger and clock I/O for multiboard synchronization; Front-panel and Internal access. 8 Bidirectional digital TTL I/O lines. Conforms to PCl Bus Specification, Revision 2.3, 66/33 MHz 64-Bits, with Universal Signaling. PCI burst rates to 400MB/sec. Standard cPCI-6U form factor. 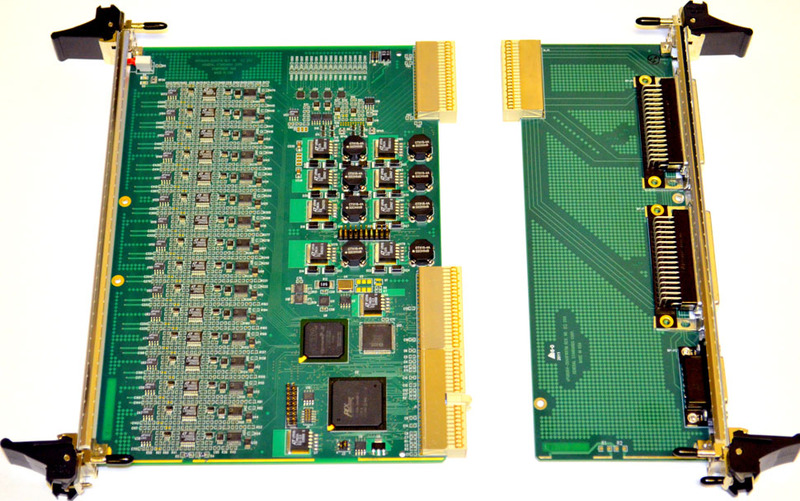 (Call for availability in PCI and PCI-Express form factors). DMA Engine supports block-mode and demand-mode transfers in two DMA channels. On-demand offset and gain autocalibration of all channels.